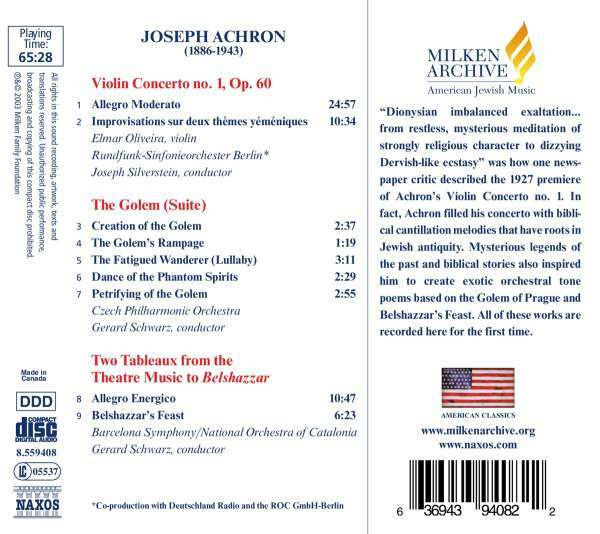 Der Artikel Joseph Isidor Achron (1886-1943): Violinkonzert Nr.1 wurde in den Warenkorb gelegt. +Der Golem; Allegro Energico & Belshazzar's Feast aus "Belshazzar"
»Dionysian imbalanced exaltation... from restless, mysterious meditation of strongly religious character to dizzying Dervish-like ecstasy« was how one newspaper critic described the 1927 premiere of Achron's Violin Concerto no. 1. 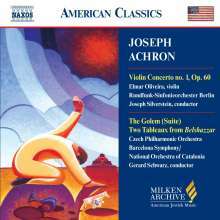 In fact, Achron filled his Concerto with biblical cantillation melodies that have roots in Jewish antiquity. Mysterious legends of the past and biblical stories also inspired him to create exotic orchestral tone poems based on the Golem of Prague and Belshazzar's Feast. All of these works are recorded here for the first time.